With deep roots in the restaurant and bar industry, husband and wife team Joe and Mari Elena Raya sought out to simplify the process of making craft cocktails at home. 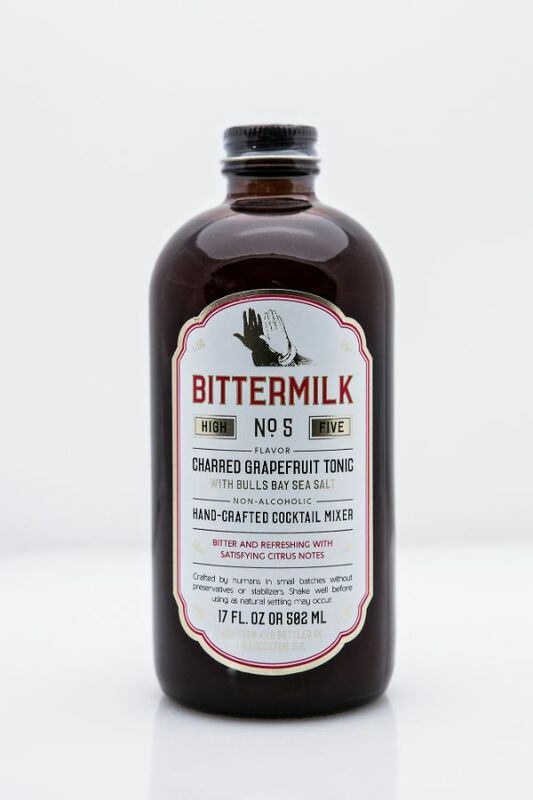 Bittermilk is a line of cocktail mixers made for cocktail enthusiasts by bartenders with real ingredients. Crafted and bottled by human hands in Charleston, SC. The labor is in the bottle, just add booze. Inspired by fresh citrus, owners Joe and Mari Elena Raya developed the new line to offer a tonic not available in the market. Featuring another local company—Bulls Bay Sea Salt—the No. 5 is a balance of organic lime and lemon juices, organic cane sugar, along with cinchona bark, the source of quinine for tonic. Fresh grapefruit is peeled and torched to extract a bitter yet refreshing citrus note in the mixer. The product goes well with white spirits and all that is needed is an equal part of No. 5, booze and soda water for a great summer cocktail.